With dual pitch hip roofs technically one could have a different pitch for all four sides (the most general case). I should probably try to code this most general case then all the rest simply fall out of it. 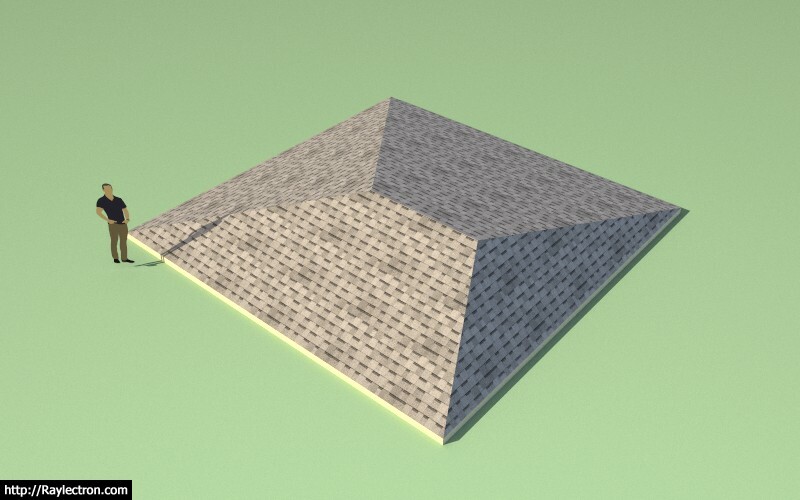 I'm not sure why one would want to construct a roof in this manner but I guess I should probably allow for the possibility. - Replaced the 64 bit SketchUp check in the installation module to fix an incompatibility issue with SketchUp 2014. - Added additional wall cladding materials in the sheathing tab of the global settings. - Fixed a bug in the top level assembly method of the roof truss module. - Sub-groups within roof and floor truss assemblies can be made persistent by naming these groups or component instances to (custom1, custom2, custom3, etc...), also all other user defined geometry (ie. faces, text, lines and dimensions) are also retained when the assemblies are regenerated by the plugin. 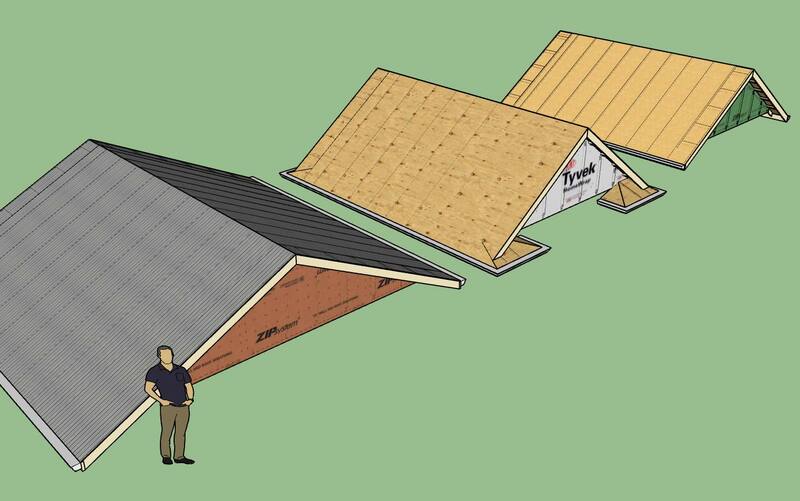 I don't have a half hip (rafter roof) setup yet however there is probably a workaround by combining a gable with a hip and then using the trim tool to manually trim some of the rafters, however I haven't really tried this at least not for a real design. 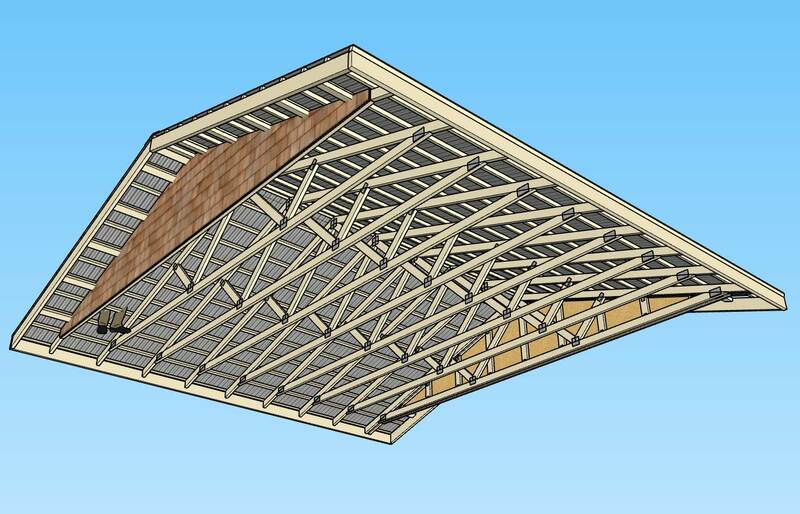 Since the end result is not parametric you will want to be sure that you have all of your rafter depths, overhangs etc... set before you dive into the manual editing of such a roof. This is obviously a painful and slow process. Conclusion, I need to add in a half hip rafter roof. - Fixed a bug so that structural outlookers can be enabled without utilizing a gable end truss. Technically this should not be allowed since structural outlookers typically require a dropped top chord and currently the only way to achieve a dropped top chord is with a gable end truss (option enabled). However, since I am not strictly disallowing it I provided some logic so that the appropriate parameters are set so that this particular state is possible. Previously, the gable end truss routine set some required parameters that the structural outlookers were dependent on. Now the outlooker algorithm will set those parameters if they are not previously set by the gable end truss algorithm. This is a fairly minor fix/patch. Save settings doesn't keep selections chosen. I need to report the Truss plugin is working… For some reason the second advanced option window did not open for me or was hidden from view yesterday. - The trim tool now allows for multiple trim operations once a trimming plane is selected. - Pressing the ESC key will reinitialize the trim tool during multiple trim operations, space bar will terminate. - The trim tool will now trim components as well as groups. - Name of plugin changed to "Medeek Truss". - Updated the licensing system to include a 30 day limit of the trial version. - Updates to the HTML pages of the global settings. This next week I plan on returning to the multi-pitch hip roof and start back up where I left off a few months ago. I am also going to be adding in the custom material manager so that the truss plugin has the same capabilities as the wall plugin. 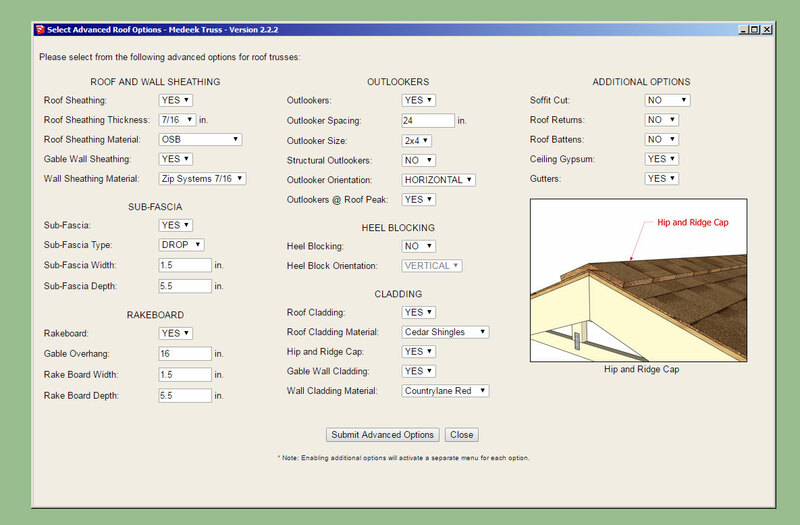 After that the next big push is to make all of the rafter roofs parametric with HTML based edit menus similar to the common truss edit menu. While all this is going on I would also like to complete the stair module of the wall plugin. A lot of things to juggle right now. - Updated the "Edit Truss Assembly" menu so that it properly loads default values when advanced options are expanded. - Added a user definable name to truss assemblies that will be utilized in the future options and upgrades. A number of other "under the hood" updates (to numerous to list) were also incorporated to bring the code more in line with the wall plugin and its more efficient and modular organization scheme. 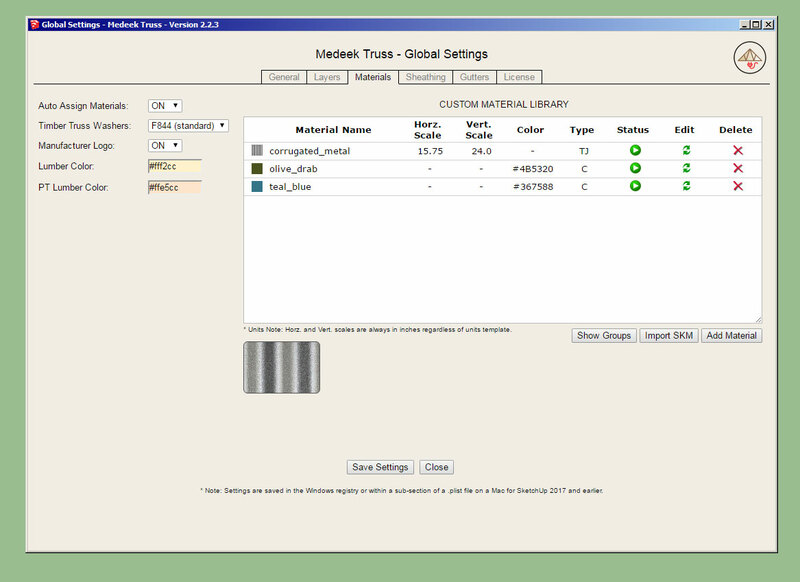 - Added a Custom Material Library/Manager in the Materials tab of the Global Settings. - Enabled custom materials for wall sheathing, wall cladding, roof sheathing and roof cladding in the HTML wall draw and edit menus for common trusses. - Enabled the ability group materials and control which drop down menu they will appear in. - Added an SKM file import utility to the Material Library. - Default wall sheathing and wall cladding materials brought in line with options available in wall plugin. Also note that the custom and expanded materials selection is only available for common truss shapes (ie. common trusses, scissor trusses etc...). I have not yet implemented the new system for other truss shapes and rafter roofs, that is work for yet another day. There is still a tremendous amount of work that needs to be done with this plugin. Many of the specialty truss shapes do not even have advanced options available to them yet. All I can do is keep hacking away at it and maybe one day I will have the resources to really push this thing along. SU completely crashed when in the advanced options and the materials manager came up in an empty dialog box. Started to edit a truss assembly. Noticed you can select corruated metal for both sheathing and cladding? I wanted to have trusses without sheathing but with battens then corrugated metal as cladding. Anyway, when in the edit truss screen, update will not produce changes. Thank you for the additions to the truss plugin. Long awaited. Wow, that is weird, its like you are getting some sort of cross pollination between the wall plugin and truss plugin. I just uninstalled and installed the truss plugin and could not duplicated either of these errors. My suggestion would be to uninstall the Truss plugin and then reinstall it. P.S. - Actually strike what I just said, I enabled battens and I'm able to duplicate the error below, looking at it right now, I will issue a fix very shortly once I get to the bottom of it. - Fixed a bug in the attribute library for common trusses. For this type of cladding it might be useful to have a parameter which allows one to have the cladding project beyond the fascia a specified amount. Clicking "Submit Advanced Options" does nothing. Ruby script below appears. I will try to uninstall/reinstall?